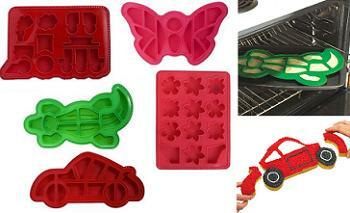 What a great way to have fresh cookies at work or while camping. Can’t wait to try this this summer. Home made cookies without turning on the oven. Love that! Fun! 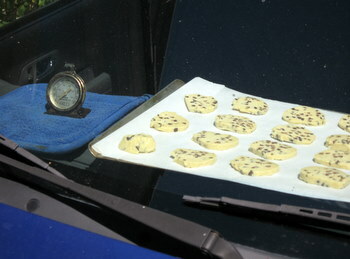 With this heat wave we have now, I don’t think I would have any problem making those in my car. 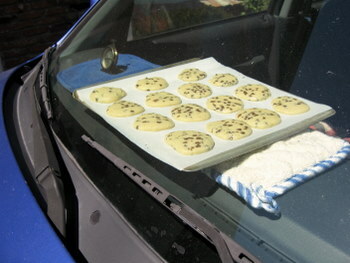 I think the old saying now should be “hot enough to bake cookies in my car” instead of “hot enough to fry an egg on the sidewalk”! So cool! You know what this means, right? 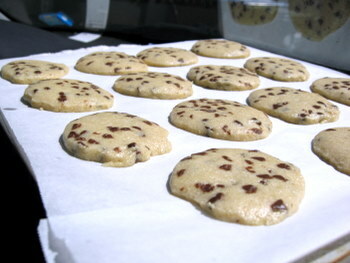 The smell of freshly-baked cookies in your car–please tell us how long this scent lasts!!! This is genius! Fantastic idea! I bet these make your car smell fantastic as well. So this is what you should do when trying to sell a used car? Who wouldn’t want to buy the car that smelled like fresh-baked cookies?! What happens if you leave them in for a full 8.5 hours while you’re at work? 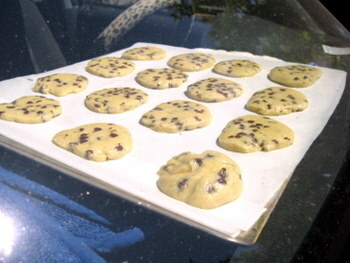 I want to set them up when I go to work, and get off work to find edible cookies in my car. Will they dry out, be rock hard, etc, etc? 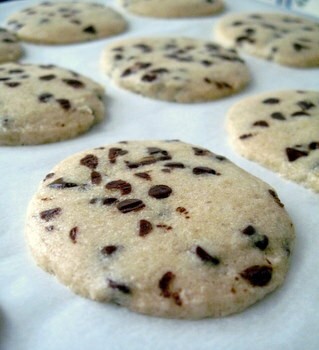 Perhaps adding a bit of cocoa to the dough would give them more of an appearance of an oven-baked chocolate chip cookie. I knew a couple who would dehydrate wild mushrooms on cookie trays in their car. I made sun-dried tomatoes in my car a couple years ago when we had a heat wave and a bumper tomato crop. I am trying out this cookie recipe this week! I love the idea of adding cocoa to the dough so that folks won’t be put-off by the light color. I have a Jewish friend of mine who made some car baked matzo bread last summer.He spread the mixture onto a cookie sheet,and let the sun do the rest. It took the better part of the afternoon,but it turned out very well. This is a great idea!!! 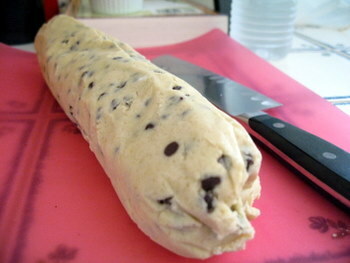 I would use pre-made cookie dough,then switch to dough that I make. I often crave for sweets in the car,so it wouldn’t be a problem to try this! Only in the summer though. For once,we’re lucky to have hot weather here. What a wonderful idea! I’ve heard of making fruit leather like this, but never gave biscuits a thought. Love the idea of making Matzo in the car. I usually stash all my leavening in there each April to get it out of the house! Hi Nicole, I was just wondering what if you’ll cook the cookies for 3hours? Is it possible for the cookies to turn brown color? I love your brilliant idea and I was planning on trying this process with my family. Thank you. Gwendolyn – Browning is a result of the Maillard reaction, and your car is unlikely to get hot enough to reach a temperature at which this would occur, so these cookies will always be a little bit paler than over-baked cookies. Do Gooder Press - Is it hot in here, or is it just Godzilla? Let's cook - in the car! ?